← DontCrack Exclusive – Audified STA Effects at 50% OFF ! 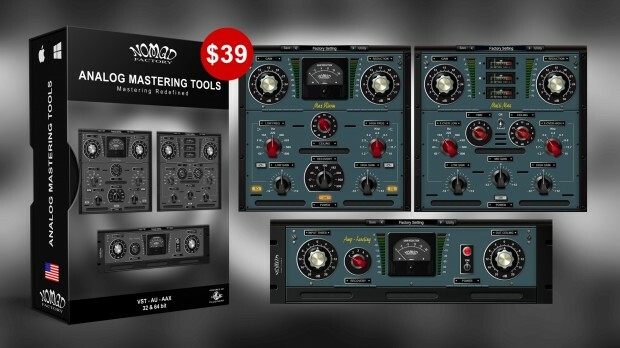 Nomad Factory’s Analog Mastering Tools is now on sale at only $39, a huge saving of $90 list price! Analog Mastering Tools sets a new standard for mixing and mastering your music with a subtlety and musical character reminiscent of tube systems. The Analog Mastering Tools (A.M.T.) is high-resolution limiter and multi-band dynamics processor that sets a new standard for mixing and mastering your music with a subtlety and musical character reminiscent of tube systems. The A.M.T Amp Leveling is a highly optimized look-ahead Brickwall Limiter and Level Maximization. The A.M.T Amp Leveler has been designed to be used for Mixing, Mastering, Tracking and Live use. Using a new proprietary algorithm ensuring a very smooth-warm sounding with maximum loudness and no digital-over-clipping as well as low CPU consumption for lightening-fast processing, the A.M.T Amp Leveler is nothing short of amazing. This entry was posted in DontCrack, Plug-ins, Promotions and tagged Analog Mastering Tools, Brickwall Limiter, Level Maximization, Limiter, Mastering, multi-band dynamics processor, Nomad Factory, Tracking. Bookmark the permalink.